Students at ACS learned first- hand about the art of Pysanky. 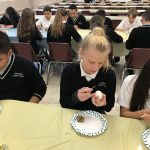 Seventh and eighth graders participated for a second year, while sixth grade had their first try at this art of decorating eggs for Easter. You might think that egg decorating is easy, but it is actually an art form that takes much patience. Under the guidance of ACS librarian, Mrs. Fedynyshyn, our own Pysanky expert, students followed the intricate steps of preparing their eggs for each layer of dye. Retired ACS teacher Mrs.Lojko assisted Mrs. Fedynyshyn in this 2 day project. Starting with bees wax, a small flame, and a stick called a Kistka, students etched their first layer while learning of the importance of finding the center of the egg and carefully mapping out their first design. Eggs were dipped in yellow dye then more wax was applied. The next was orange, followed by more wax designs. Next was red and finally black finished the whole process. Students removed the excess wax by holding their eggs near the flame to warm the wax and paper towel to actually remove the wax. When students had finished their own Pysanky, they discussed their improvements from last year and their plans for participating in this new, old tradition next year. Thank you to Mrs. Fedynyshyn and Mrs Lojko for two afternoons of enjoyment. ACS’s Security Initiative Project: New Doors! Good Friday Services at ACS.